Kamehameha Schools completed the second year of its Strategic Plan 2015-2020 (SP2020), the first in a series of strategic plans outlining how the organization will accomplish its Vision 2040. 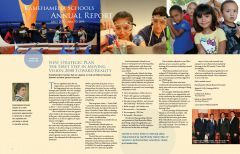 Fiscal year 2016 was a significant year for Kamehameha Schools, as we completed the first year of our Strategic Plan 2020 (SP2020) and laid the groundwork toward achieving our vision for the future. 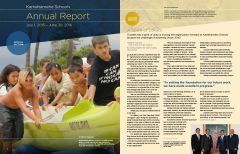 This is a significant time for our organization, as July 2015 marked the beginning of our new five-year strategic plan (SP2020). Our new strategic direction is anchored on the mission of Kamehameha Schools: to fulfill Pauahi’s desire to create educational opportunities in perpetuity to improve the capability and well-being of people of Hawaiian ancestry. 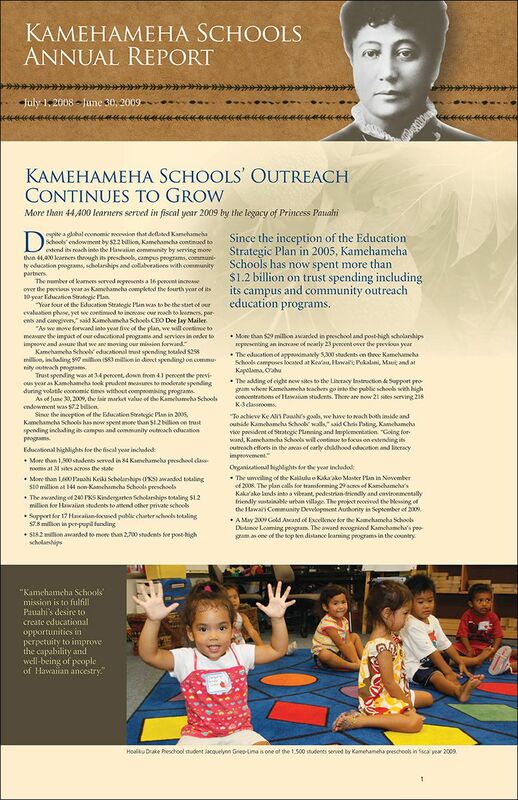 For the fiscal year ending June 30, 2014, Kamehameha Schools invested $378 million in its campus- and community-based educational programs and services statewide, including $165 million on campus-based programs and $112 million on community-focused programs. For the fiscal year ending June 30, 2013, Kamehameha Schools expended $362 million in its campus- and community-based educational programs and services statewide, an increase of $23 million over the previous year. 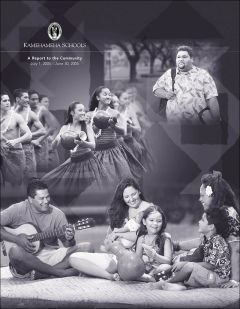 In the 12th year of the Kamehameha Schools Strategic Plan and seventh year of the Kamehameha Schools Education Strategic Plan, the number of children and families impacted by Kamehameha Schools’ campus and community programs increased from 46,923 learners in the previous year to 47,408, which included 33,910 students and 13,498 parents and caregivers. 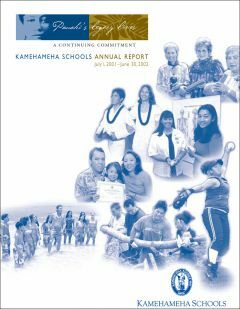 Kamehameha Schools served nearly 47,000 keiki and their caregivers through its preschools, campuses, community education programs and collaborations with other organizations during this past fiscal year, which ended on June 30, 2011. Kamehameha Schools served more than 45,000 keiki and their caregivers through its preschools, campuses, community education programs and collaborations with other organizations during this past fiscal year, which ended on June 30, 2010. 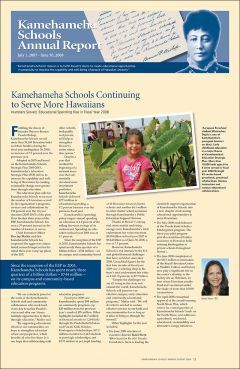 Despite a global economic recession that deflated Kamehameha Schools’ endowment by $2.2 billion, Kamehameha continued to extend its reach into the Hawaiian community by serving more than 44,400 learners through its preschools, campus programs, community education programs, scholarships and collaborations with community partners. 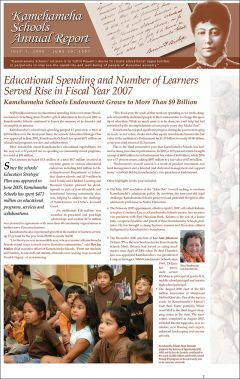 Despite a year that marked the beginning of a national recession that substantially devalued most investment portfolios, Kamehameha Schools served more than 38,100 students and delivered more than $273 million in trust spending — 2,100 more learners and $23 million more than in FY2007. Kamehameha Schools extended educational opportunities to more Hawaiians than ever before during the 2006-07 fiscal year. The number of children and families impacted by Kamehameha Schools’ campus and community programs increased by 27 percent — from 28,000 to nearly 36,000 students and more than 30,000 additional learners were served through one-time or intake programs that introduced learners to KS programs. 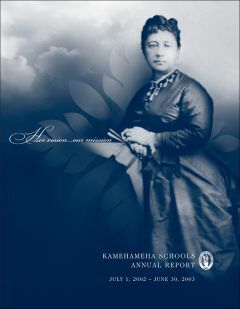 Kamehameha Schools exists to build strength and hope through education for generations of Native Hawaiians to come. By every standard, fiscal year 2006 — from July 1, 2005 to June 30, 2006 — was a time of exceptional performance. 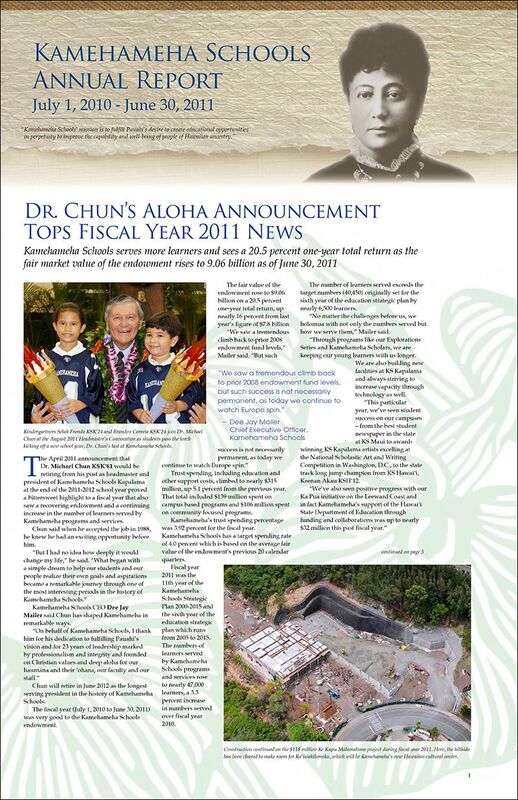 In the fiscal year 2005, Kamehameha Schools made extraordinary progress toward fulfilling our princess’ wishes — to reach to more Hawaiians through education. 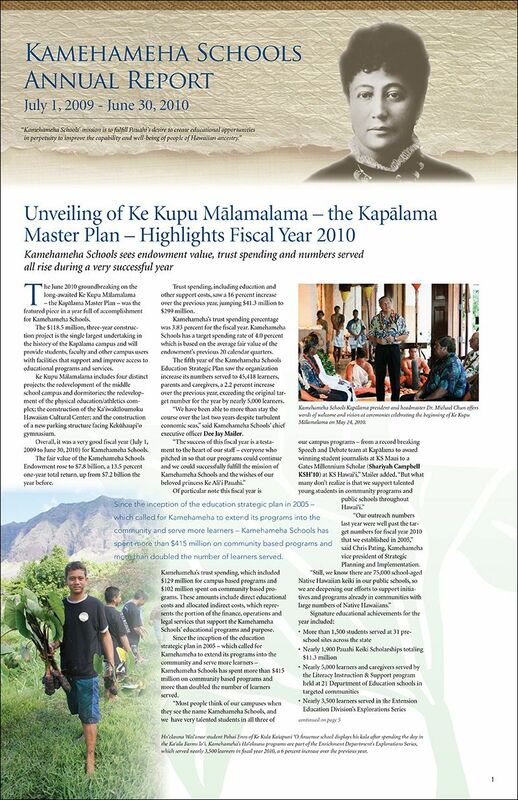 Through the steadfast support of our Kamehameha ‘ohana and the community, and the strength of our financial resources, we extended our educational reach through a broad spectrum of educational programs. 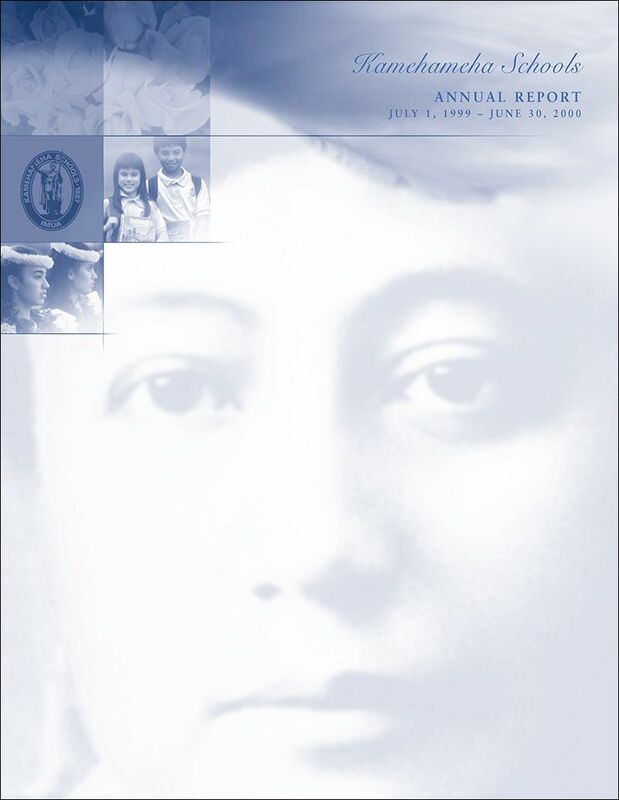 Those programs focused on prenatal care, early childhood education, K-12 education, community outreach education, and financial aid and scholarships. 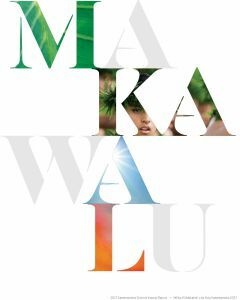 Nourished by the legacy of Princess Bernice Pauahi Bishop, Hawaiians are blossoming forth with a sense of pride and hope for a promising future. 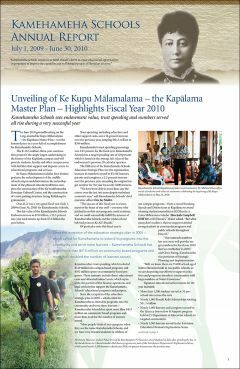 Kamehameha Schools continues to nurture these precious flowers — na pua a Pauahi — as it carries out Pauahi’s vision: to create educational opportunities in perpetuity to improve the capability and well-being of Hawaiians. 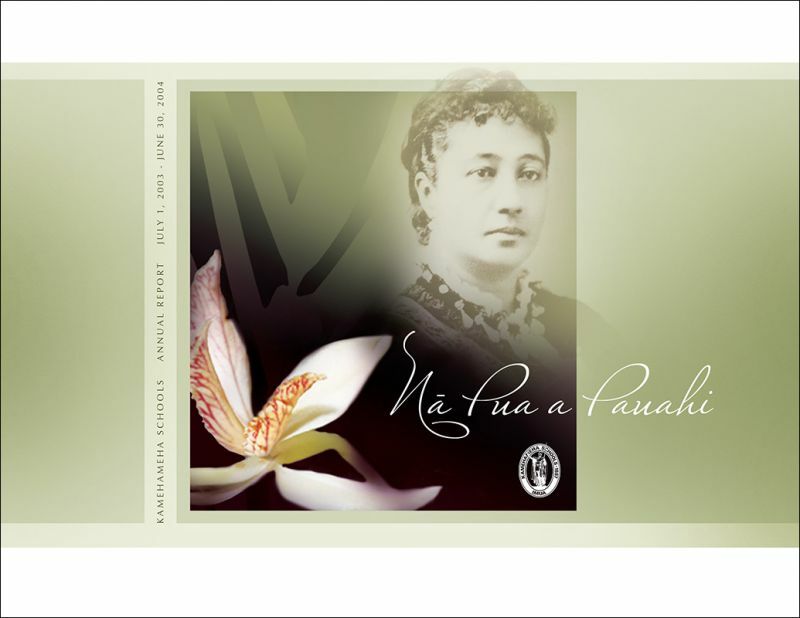 Princess Bernice Pauahi Bishop countered adversity with hoʻomau (perseverance) to carve out a vision that would save her people. 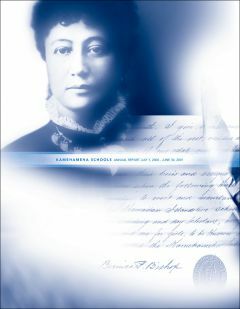 Her vision was to improve the capability and well-being of Hawaiians through education. The adoption of Kamehameha Schools Strategic Plan 2000-2015 directs us to fulfill Pauahi’s desire to create educational opportunities in perpetuity to improve the capability and well-being of people of Hawaiian ancestry. 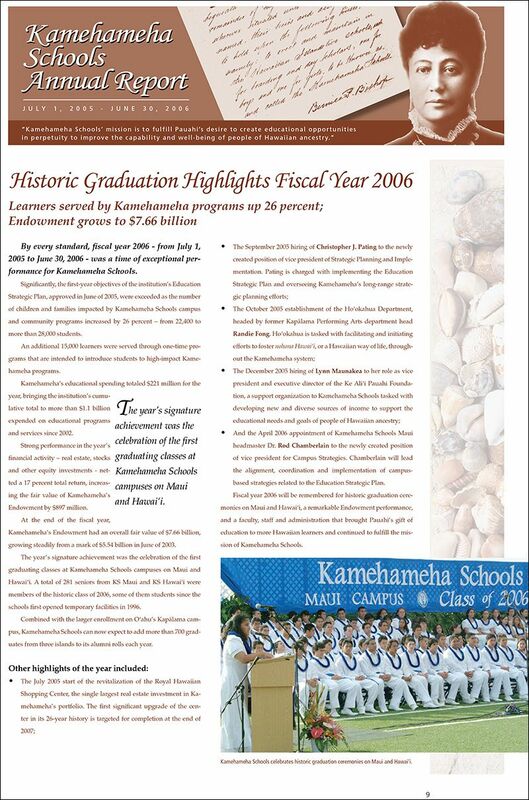 By the end of the fiscal and academic year 2000-2001, Kamehameha Schools (KS) had completed a top to bottom transformation of our institutional focus, management structure, and ways of doing business. 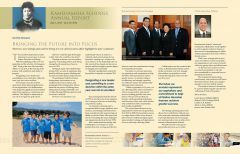 At no other period in our history has so much change occurred in such a short time; change that both prepared us for our future and restored the historic values of our mission. 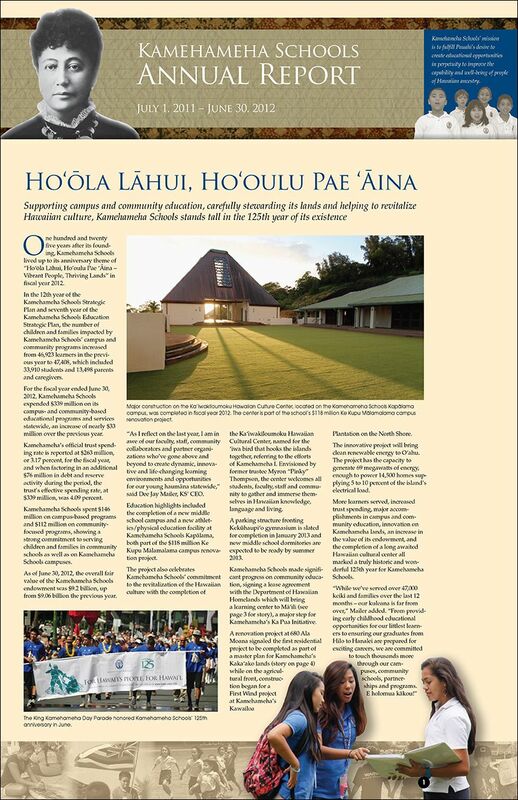 Aloha kākou! 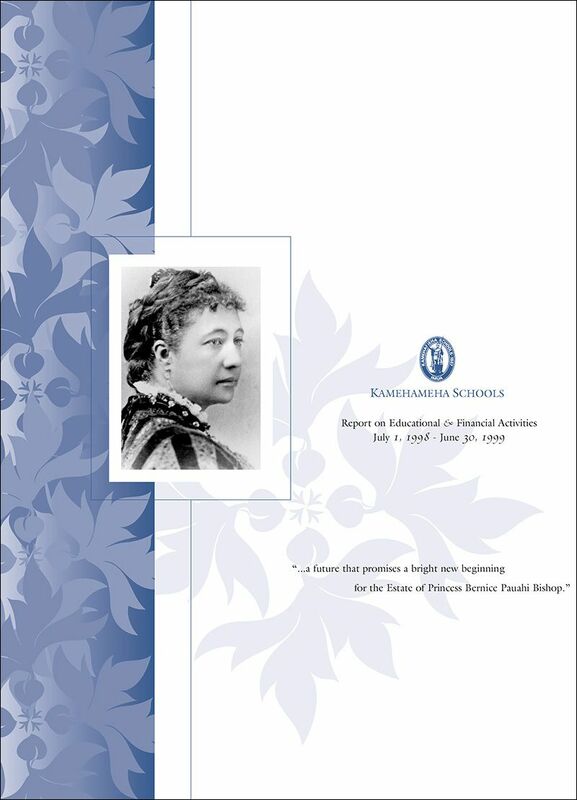 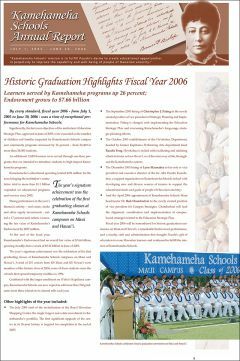 This report covers a specific period in the history of Kamehameha Schools — from July 1, 1998 to June 30, 1999. It’s a pleasure to share some highlights of a very exciting year.